S&I are avid fans of the P7 Wireless, a set of professional-quality headphones that deliver pristine sound on the move with the added convenience of high-quality Bluetooth aptX wireless streaming. The wireless headphones is build on the success of the highly regarded P7, but with convenient, high-quality Bluetooth® aptX® streaming for an exceptional all-round mobile performance. 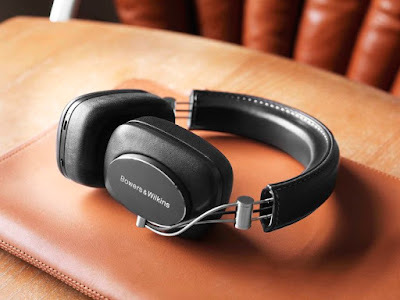 Bowers & Wilkins, a British loudspeaker company famed for creating the world’s best loudspeakers, announced the new P7 Wireless headphones earlier last year. Delivering professional quality sound on the move with the added convenience of simple wireless streaming, P7 Wireless set a new standard for on-the-go listening. P7 Wireless builds on the dual success of the original P7 and the award-winning P5 Wireless. Thanks to the acoustic advances made with the original P7 drive units, sound performance is a revelation: bass is tighter, vocals are more defined, and there’s a wonderful sense of space, balance and clarity across the whole frequency range. P7 Wireless combines this with aptX™ Bluetooth® connectivity to deliver an unrivalled and seamless audio experience. Within seconds, P7 Wireless can be paired with any of the most popular Bluetooth-enabled devices such as a phone, tablet or computer. Once paired, it’s as simple as switching on and pressing play. P7 Wireless' beating heart is the drive unit, painstakingly developed to unearth every note in your music, allowing discerning users to stream Hi-Fi quality music on the go to a quality never experienced before. P7 Wireless delivers all the highs and lows of your favorite music, while the ultra-soft memory foam cushioning creates a comfortable and high-quality listening experience. Playback is elegantly managed via intuitive on-board controls, and a rechargeable battery offers a healthy 17-hours of wireless playback, and can be easily charged via USB. For times when a cable is required, one comes supplied in the box. P7 Wireless is crafted from the finest materials, including aluminium and sheep leather, for performance, luxury and durability. The headphones are foldable, making them easy to travel with, while the luxurious design continues with a carry case that keeps your P7 Wireless safe when not in use. P7 Wireless is a welcome addition to the growing collection of headphones from Bowers & Wilkins. Worn over the ear, with the added comfort and noise blocking of memory foam cushions, they follow in the footsteps of the on-ear P5 Wireless, both made with the same knowledge and experience in acoustic excellence that only Bowers & Wilkins can deliver. Bowers & Wilkins has future-proofed its coveted headphones by launching a wireless pair of its P7 over-ears. The cord-cutting new headphones have been unveiled just as the demand for Bluetooth audio is set to heat up. At Sound & Image we are excited about the new P7 Wireless. If you want a pair of high-end headphones that sound as good as they look, then the P7 Wireless is just for you. S&I Verdict - The Bowers & Wilkins P7 Wireless offers impressive build quality, good comfort and smooth, rich sound in an over-the-ear headphone design that shuts out a lot of external noise. Wireless operation is nearly flawless, battery life is good and a premium carrying case is included. The P7 Wireless headphones deliver the great design and construction that Bowers & Wilkins is famous for, and the quality of their sound is fantastic when paired with the right music.